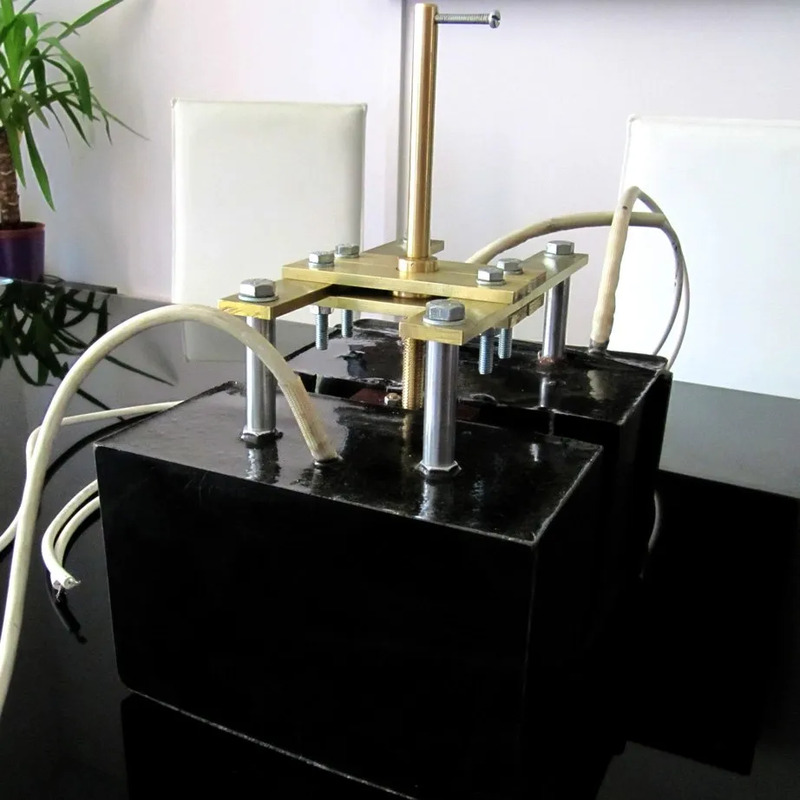 We produced a Lakhovsky MWO heavy duty replica of superior quality which is in every significant aspect (frequency content, output power, signal envelope, phase reversal, concentric antenna etc.) virtually identical to the original Multiple Wave Oscillator model BV2 that was originally produced between 1933 and 1940. Technical specifications that we used as a guide were based on detailed information found in the comprehensive reverse-engineering report of the three historical Lakhovsky oscillators published in an eBook “The Lakhovsky Multiple Wave Oscillator Secrets Revealed” by Tony Kerselaers and Bruno Sacco. 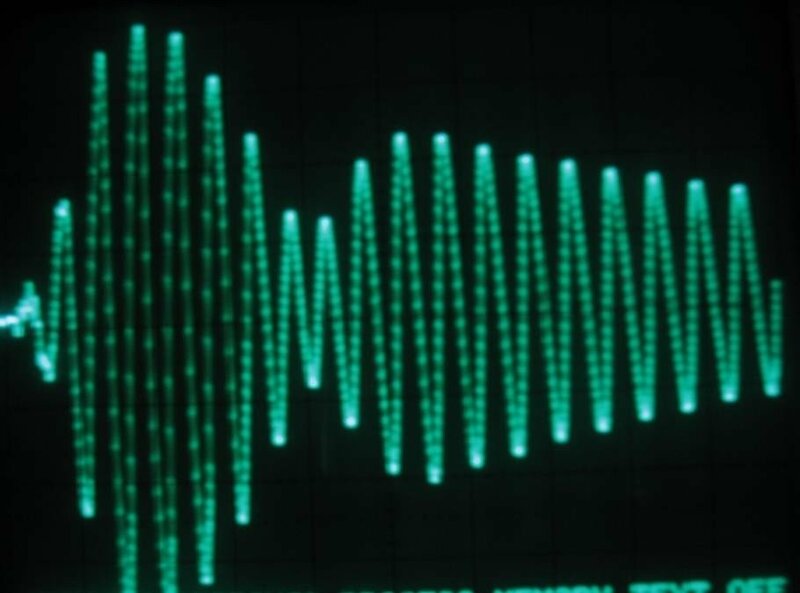 Multi Wave Oscillator devices have been mentioned in literature for decades. However, the technical details and specifications were largely unknown and in the speculative domain. There have been many notable attempts of deducing the design Dr Lakhovsky’s Multi Wave Oscillator based only on general descriptions. However, those were based solely on educated guesses and in many cases such designs significantly strayed from the original design, resulting in the devices of dubious bioactive properties. The most comprehensive practical and theoretical research on bioactive effects of Lakhovsky’s Multi Wave Oscillator and clinical treatment of various diseases is published in an eBook “Biological Effects of Exposure to Multiple Wave Oscillator Fields” by Tony Kerselaers that reveals how Multi Wave Oscillator affects the living organisms. We manufacture superior quality historical replicas of the Lakhovsky Multiple Wave Oscillator model BV2, and we do not make any claims of possible bioactive and medicinal effects. It is the responsibility of a user to observe necessary caution and pertinent safety and to comply with EMI/RFI regulations. For a Multiple Wave Oscillator to operate properly and safely, it is user’s responsibility to ensure adequate electrical installations and earthing (grounding). 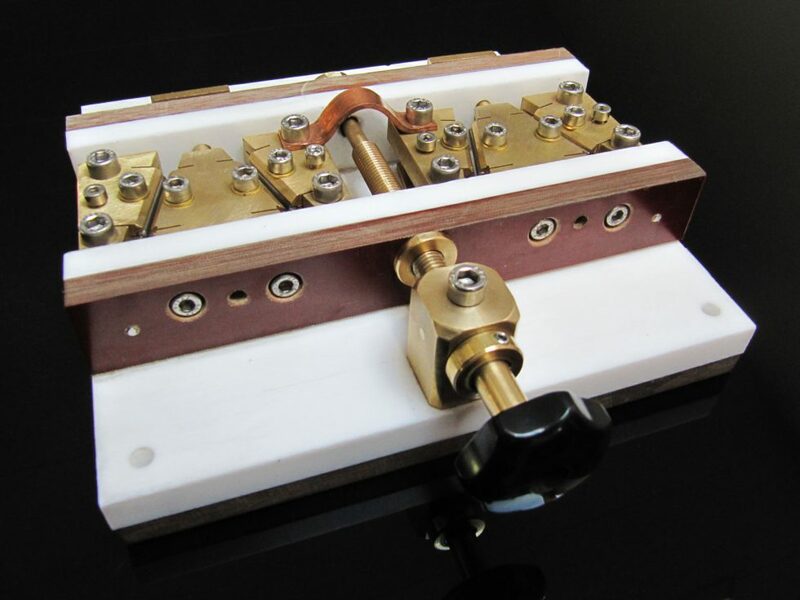 To ensure the produced signal similarity to the original devices, we made acrylic coil formers which hold primary and secondary windings of the high voltage Oudin resonator. By machining the grooves on the surface of the former, we ensured preciseness and compactness of the windings. 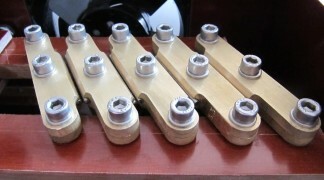 After resonator coils were made, they were tuned in compliance with the historical specifications. 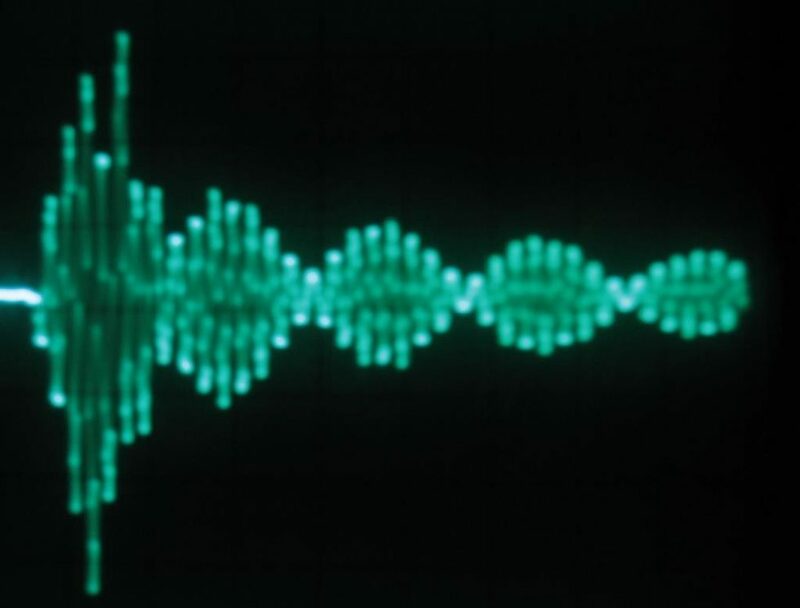 In this particular case, the basic resonant frequency of the transmitter secondary was tuned to ~906-910 kHz, while the resonant frequency of the transmitter primary was tuned to ~840 kHz. 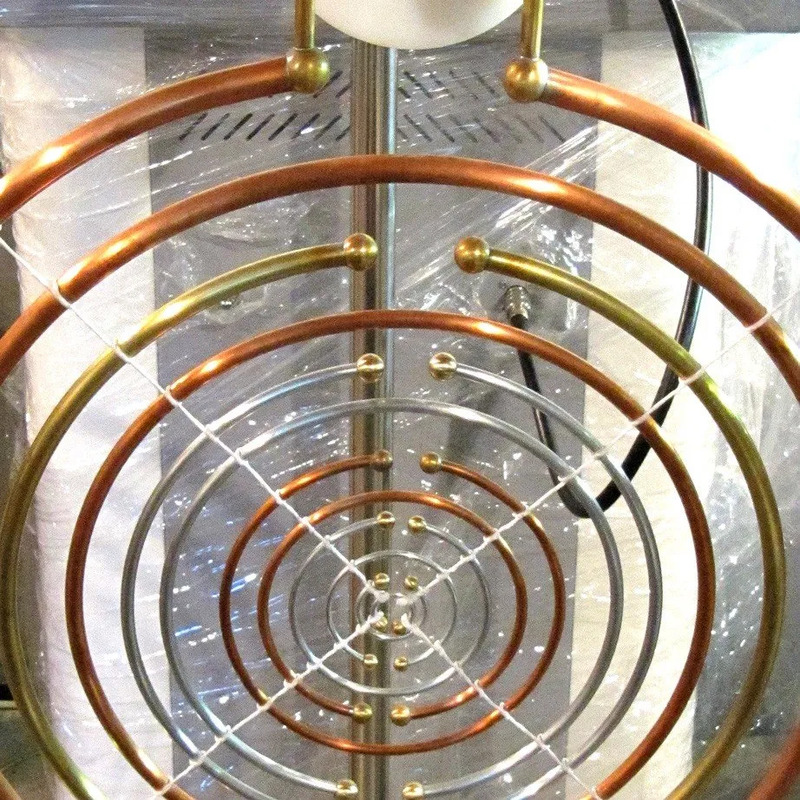 On the reflector side, the resonant coil was tuned to ~880 kHz. 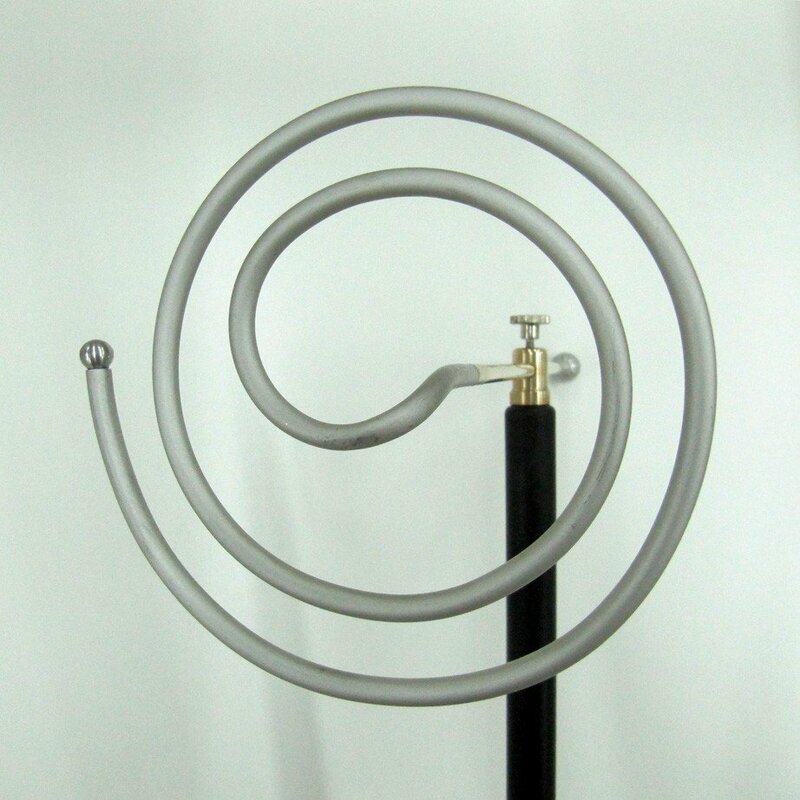 Split-ring resonator antennas were made according to the original Multi-Wave Oscillator BV2 model specifications. We opted to use silken ropes harness identical to the original to retain as much authenticity as possible compared to the historical original. Although it may appear that silken ropes are susceptible to charring when exposed to effluvia, in the tests we proved they can easily withstand extreme conditions of being exposed directly to stable RF discharges (something never encountered in normal operation of the device). Capacitors are the components that suffer most stress due to powerful and fast discharges they have to provide to the primary coil. Although we could have used smaller single components like pulse rated Strontium-Titanate capacitors, in our experience such components tended to gradually heat up during prolonged periods of operation with the consequent loss of performance and increased decay of the dielectric. 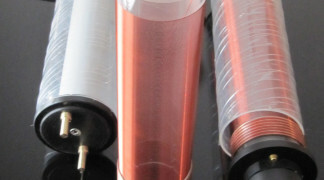 Instead, we opted to use so-called Multi-Mini Capacitor (MMC) type of design. Simply said, many smaller capacitors are connected in such arrangement which divides voltage stress and heat losses among individual components. 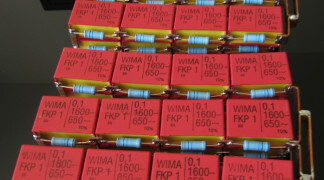 In our cases, we used high impulse rated film capacitors manufactured by WIMA. 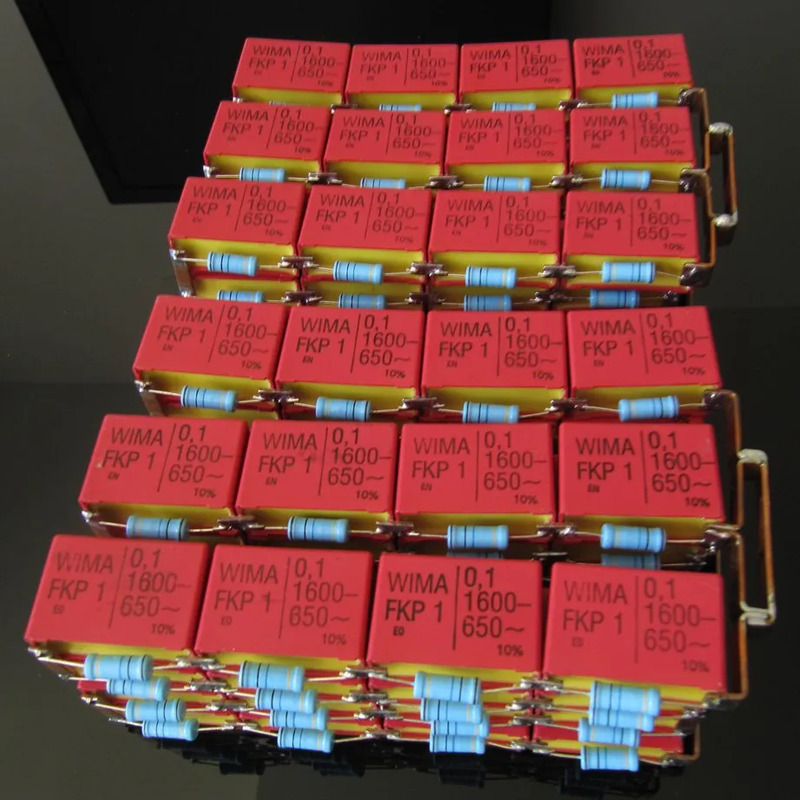 Additional high-quality bleed resistors with the appropriate voltage rating of 10 kV per device were used to ensure fast discharge of the capacitors when the Multi-Wave Oscillator is not operating. In this particular case, we used 48 individual capacitors per MMC. In total, we used 96 capacitors in the entire Multi Wave Oscillator primary tank circuit with the net voltage rating of the capacitors at ~26’000 Volts. Thus, the nominal voltage rating is about 400 % higher than the maximal output voltage rating of the high voltage transformer used to charge capacitors. 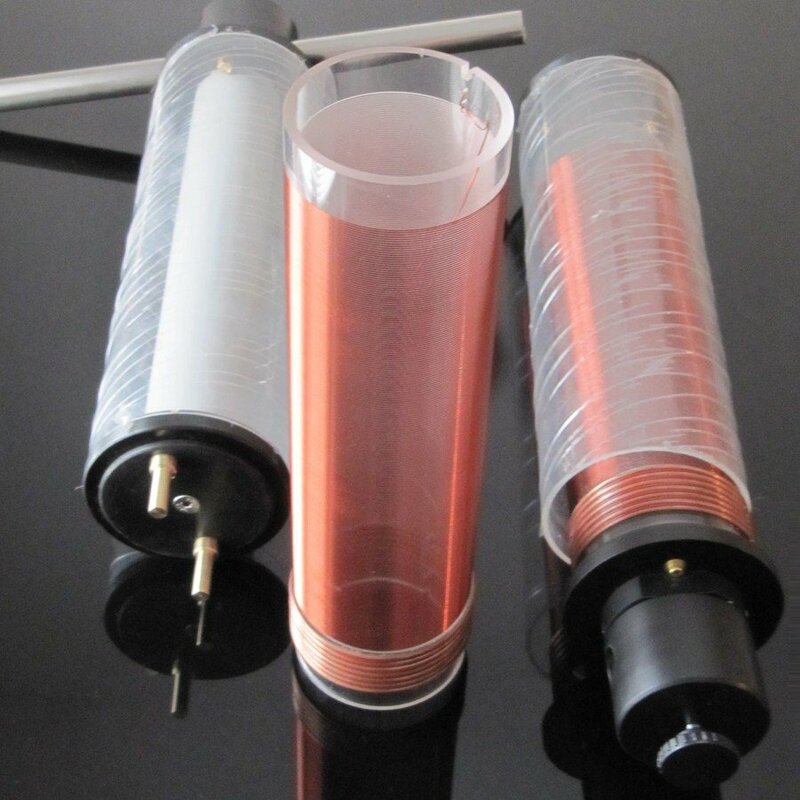 In such way, we provided a considerable margin of capacitor’s reliability and longevity of the components. 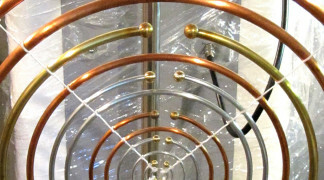 The capacitors were all connected with thick copper bus bars which are connected both mechanically and by soldering. The symmetrical arrangement of the capacitor strings ensures that all branches are equally stressed during a discharge cycle. 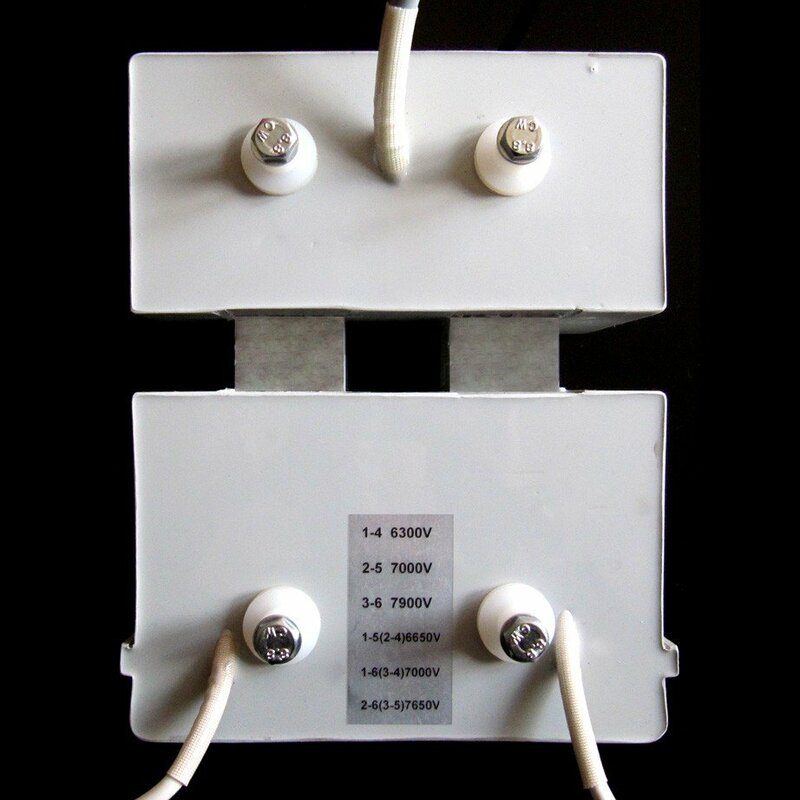 After MMC was put together, it was placed in the ABS enclosure and vacuum-potted by high voltage rated epoxy compound. 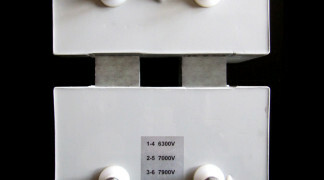 The placement of the entire arrangement into plastic enclosure allowed for more comfortable placement of the capacitors into the base unit enclosure. 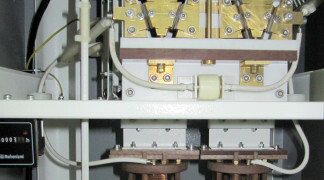 High voltage, radio-frequency chokes are used for suppression of transients that may damage the windings of the charging high voltage transformer. 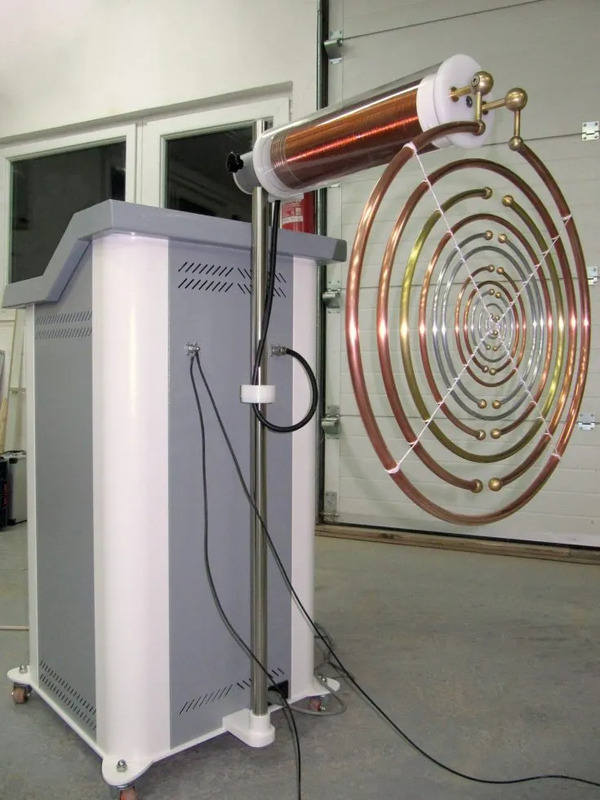 Although the secondary windings of our custom made high voltage transformer was tested to 25 kV DC we decided it was better to reduce the risk of damage even further. 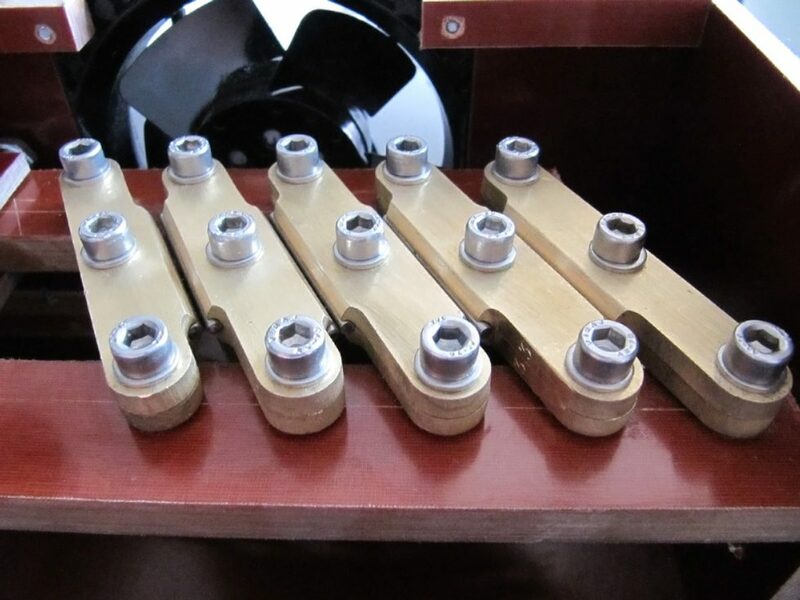 HV RF chokes were made according to technical specifications of the historical Multi-Wave Oscillator BV2 model and proved to be quite efficient in transient suppression. Spark gap that was used was the improved version of the historically used V-type spark gap. While there is nothing unusual about the way this type of spark gap operates (quenched spark gap) its unique geometry provides more precise adjustments of the gap between wolfram (tungsten) electrodes. Additionally, by using the circumferential surface as discharge area, it is possible to use thinner wolfram electrodes that are usually available on the market. In that way, a user can easily buy replacement electrodes, which are the only spare parts in the entire Multi-Wave Oscillator. To improve the smoothness of movement, we modified adjustment mechanism, and additional PTFE (Teflon) layer was added to prevent any possible charring of the underlying Bakelite which could lead to short circuit and burn out of the Bakelite. We also modified electrode holders, so it is now possible to replace the electrodes without the need for disassembly of the spark gap. 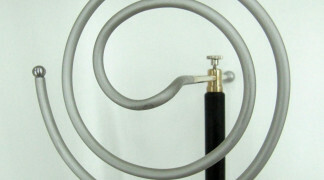 The electrodes are standard 3.2 mm type which can easily be bought in welding equipment shops. UPDATE: We now use a different kind of spark gap. There are several reasons why we decided to change the V-type spark gap for the new and improved type. We also had to improve cooling of the electrodes and their holders if the device were to be able to operate for prolonged periods. 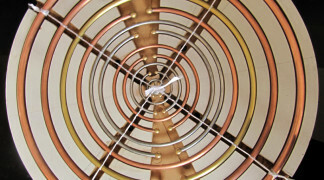 We opted to use forced air cooling by introducing two large industrial axial fans. Their combined airflow throughput of ~320 m3/h proved to be crucial during more extended periods of operation because it kept the temperature stable between 50-55°C. 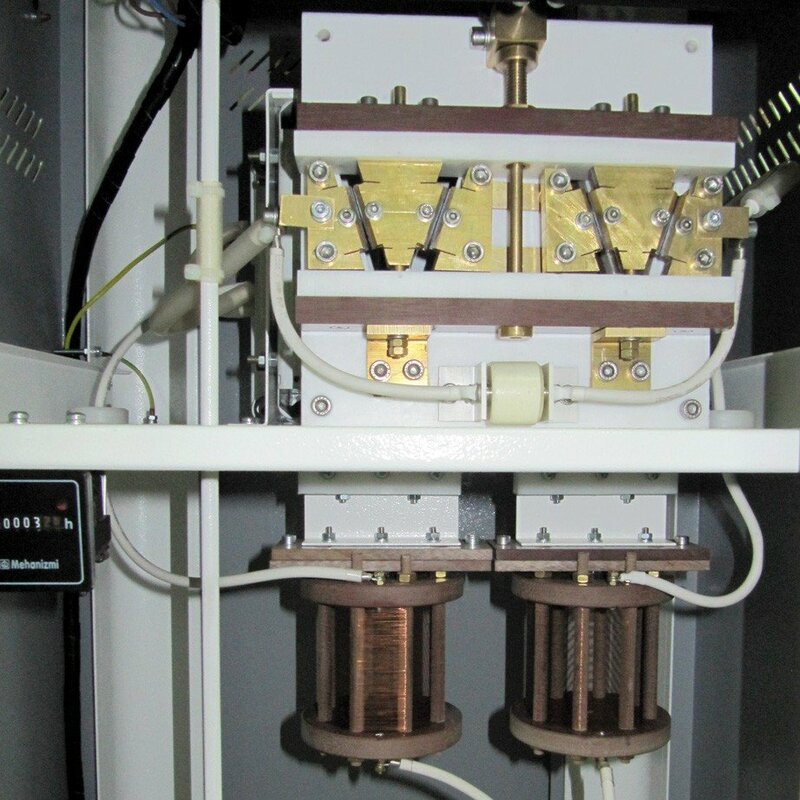 Safety spark gap is another component that is used to protect secondary winding of the high voltage transformer by discharging transient peaks into the grounding. 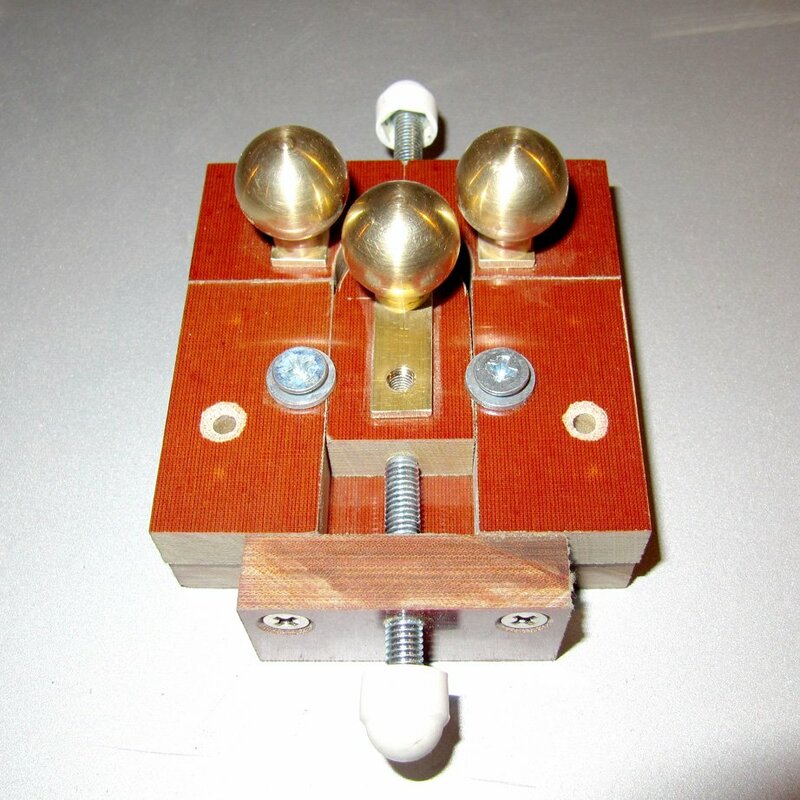 In this case, we designed easily adjustable spark gap with three spherical electrodes, one of which is grounded. It proved to be quite efficient, and in normal operation, it doesn’t heat up significantly. 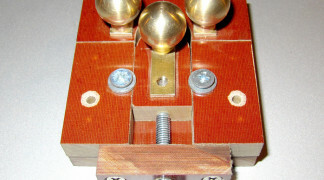 Components testing is one of the crucial parts of the manufacture of any functional replica. For the devices to be able to operate reliably for many years, all components have to be able to withstand extreme operating conditions found in normal operation. Based on practical experience, we usually produce components that can withstand even the most extreme conditions that will never be encountered in normal operation. 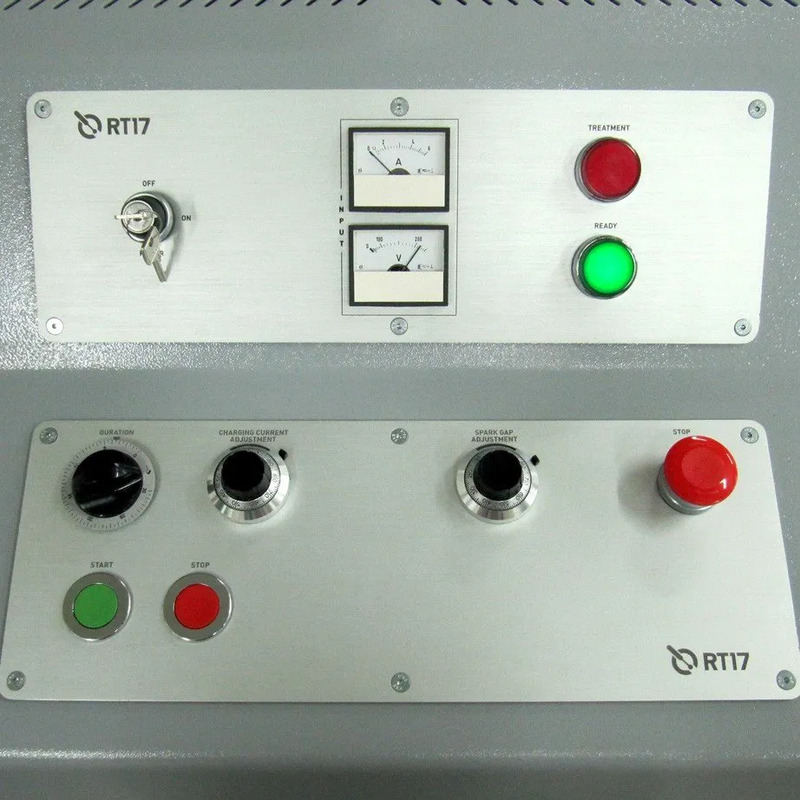 In case of the heavy duty replica model, our primary concerns were the voltage and current ratings of the critical components and their heating during prolonged periods of operation (high voltage capacitors, primary tank wires, spark gaps, high voltage transformer and high voltage resonators). Once we assembled, tuned and tested all components, we run it in the normal operating conditions until we were satisfied that the entire device operates stable, with no insulation breakdowns nor overheating of the components. Then we took the complete testing to the extreme and pushed the input/output power to ~280 % of maximal power encountered in normal operation of the device. At that point, all components were put under severe stress for over 15 minutes, and they behaved flawlessly. It means that when working under normal conditions, even for prolonged periods of time, the expected service life of all the components should easily exceed operating for 10,000 hours. Interestingly enough, during the device operation under such extreme conditions, we observed a curious behaviour with stable RF discharges forming between 1st and 2nd split-ring resonators. It is not something that has been seen before because nobody has ever driven a Multiple Wave Oscillator to such extremes. 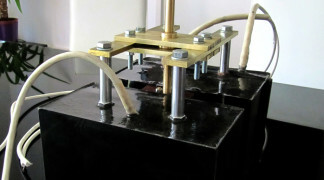 The high voltage transformer is used to increase voltage from electrical mains voltage of 230 V (or 120 V) to high voltage necessary to charge primary tank capacitors. Although we considered using electronics power supply due to its low weight, we decided it would not be a good solution in this case due to the ageing of its components which would shorten the total service life of the Multiple Wave Oscillator which can easily be measured in decades. After some consideration, we decided to add extra functionality to the original design to improve the precision of adjustment. In historical Multiple-Wave Oscillator, HV transformer had one fixed output voltage and current limiter with three settings to set charging rate of capacitors, i.e. to set output power. We opted to make this functional replica more versatile while retaining same specifications as in the original device. To achieve that we made custom made the HV transformer with improved characteristics – selectable output voltage and linearly adjustable current limiter. In that way, we married the best of the original solutions with a different, more modern approach. It also gave us the opportunity to improve and modernise the HV transformer performance and increase its maximal ratings. 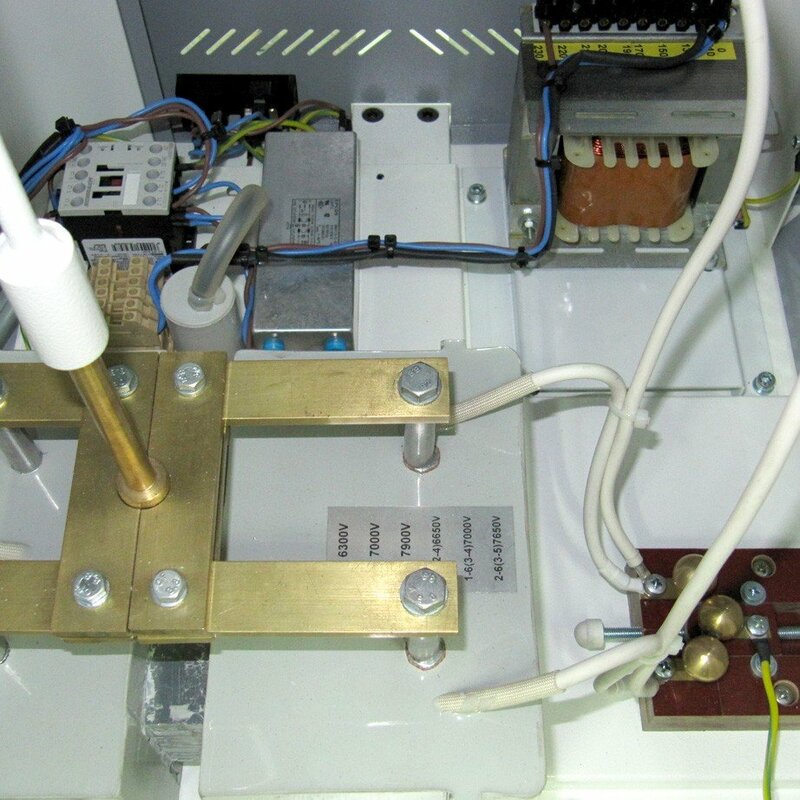 This particular transformer was made on 1000W core with vacuum potted insulation and additional layers of Mylar to increase its maximum rating which was tested to 20,000V AC and 30,000V DC. An additional adjustable magnetic shunt was introduced into the transformer’s magnetic core to limit output current in nearly linear fashion (continuously) rather than just by three settings. We decided to use galvanised steel in combination with aluminium to achieve as homogeneous grounding of the enclosure as possible and to modernise the design. 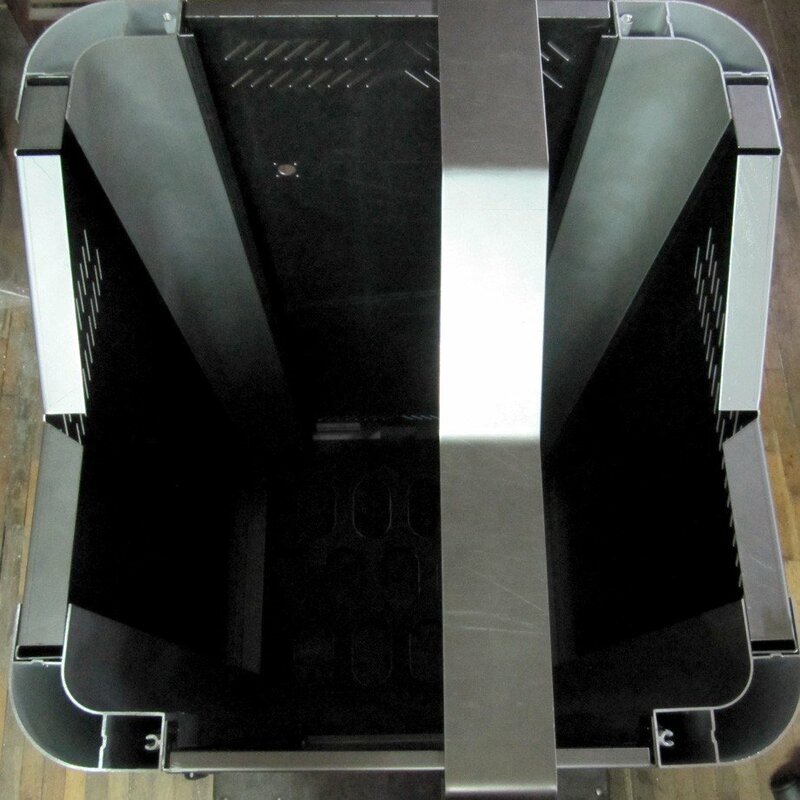 Although using 2 mm thick steel plates adds to the total weight of the device, it also makes a very sturdy chassis. 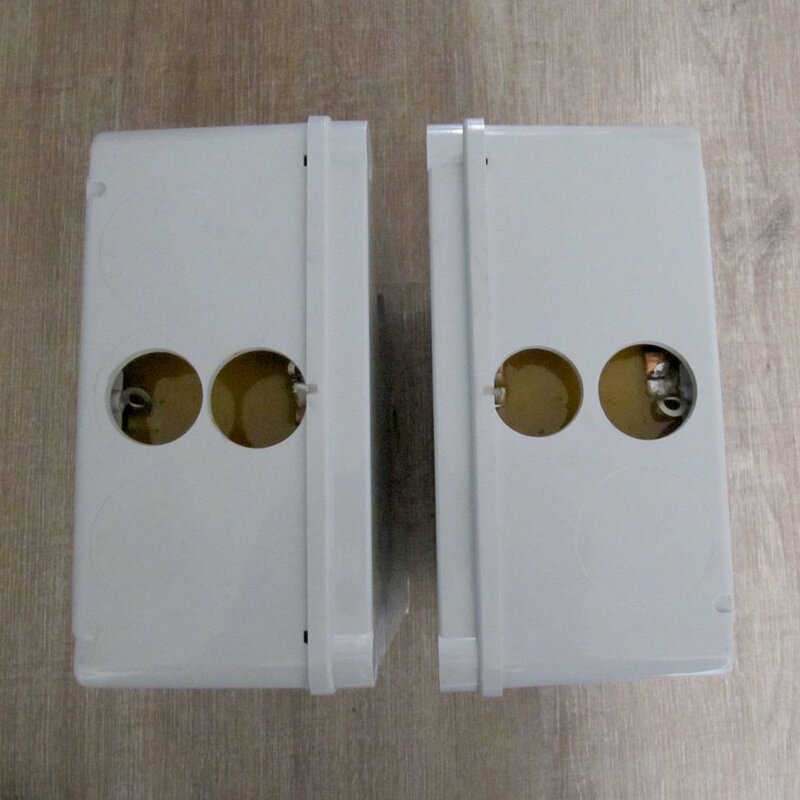 All of the enclosure elements were entirely plasticised with texture finish to protect steel parts from corrosion and to improve overall appearance. 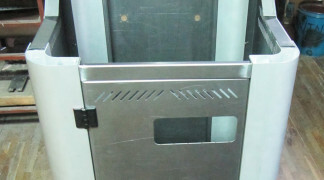 Control panels were made from thick brushed aluminium plates which were then anodised to improve panel’s resistance to oxidation and corrosion due to moisture and sweat. 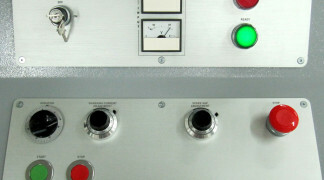 Markings of the control panels were made by laser engraving and acid etching to ensure their longevity and prevent possible fading of the letterings. 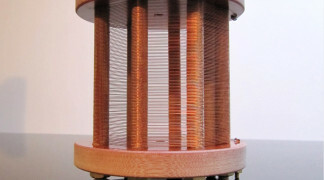 All elements of the enclosure were later connected by thick grounding wires to get the homogeneous electrical surface which makes a better Faraday cage (less EMI/RFI interferences) and virtually removes electrical shock hazard for the user. 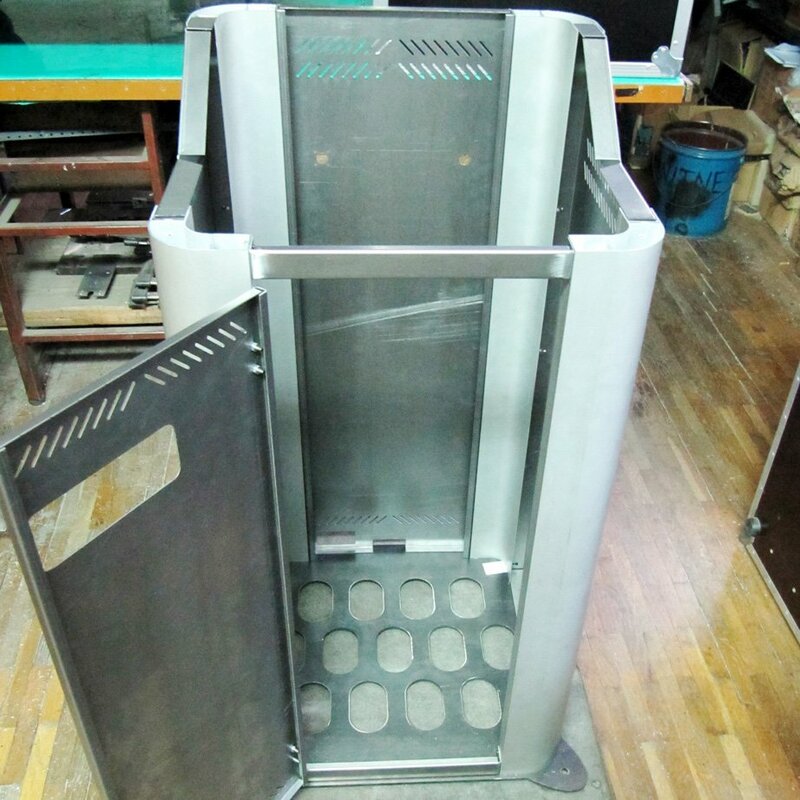 Although all internal components are non-flammable, steel enclosure also almost eliminates the risk of possible accidental fire spreading to surrounding area. 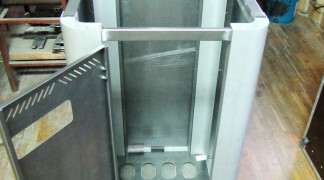 The enclosure has a service door with a key lock to ensure easy access to the internal components. Additional micro-switch prevents accidental powering on of the device when the access door is opened. For a user to be able to observe the operation of the main spark gap, we added a small observation window. The window consists of glass layers and ultra-violet light filters to prevent possible damage to eyesight. Quality of grounding plays a significant role in the operation of the Multiple-Wave Oscillator because physical ground essentially closes the electric circuit. It directly affects the efficiency of the Multi-Wave Oscillator, and a strong emphasis was put on the quality of the grounding by Dr Lakhovsky himself in his writings and notes. Later measurements performed by Tony Kerselaers and Bruno Sacco on the original devices confirmed it in their reverse-engineering report. These oscilloscope screenshots made with analyser tool described in the reverse-engineering report show different behaviour of Multi-Wave Oscillator grounded by the typical electrical mains grounding and dedicated RF (radio-frequency) grounding. The signal envelope is much more pronounced in case of dedicated grounding, as it should be if we compare it with the measured envelope of the original device. So, the better quality of the grounding means better historical accuracy and efficiency of the Multi Wave Oscillator setup. Cabling was an additional factor to take into account because other than the electrical characteristics they also had to be ozone resistant and, when possible, to provide an extra element of safety. So, for internal cabling, we used double insulated silicone cables for electrical mains and HV transformer output sections. However, we chose to use high-performance cables with insulation not resistant to ozone, so we provided silicone sleeving to protect them from the ozone-induced decay. 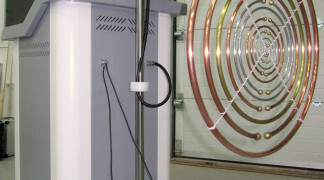 External high voltage cabling was of particular concern because it is functionally a part of the primary tank circuit. It means that in case of failure of the cable insulation there is an increased risk of accidental electrical shock which can be very dangerous due to a significant amount of energy stored in high voltage capacitors. 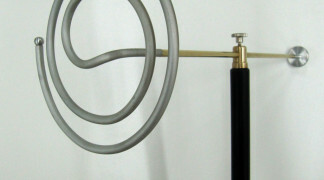 We opted to use heavy duty coaxial cable with its electrical shielding connected to electrical ground. In that way, in case of insulation failure electrical current goes directly into grounding thus providing high levels of safety for the operator. 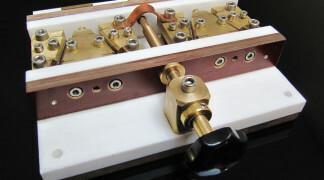 We also produced custom made high voltage connectors with thick PTFE (Teflon) insulation to match the coaxial cable and to provide continuous shielded high voltage line from Multi-Wave Oscillator base unit to the transmitter section. EMI/RFI suppression was another thing to be considered. Virtually all high voltage resonant transformers produce strong voltage transients which may be injected back into the electrical mains installation. 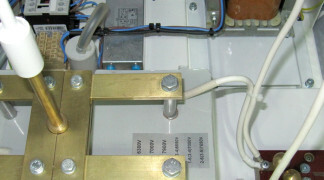 It means that interferences may adversely affect other devices connected to the electrical installation. To suppress strong transients we used high-quality, medical grade filter which proved to be quite effective in its role. 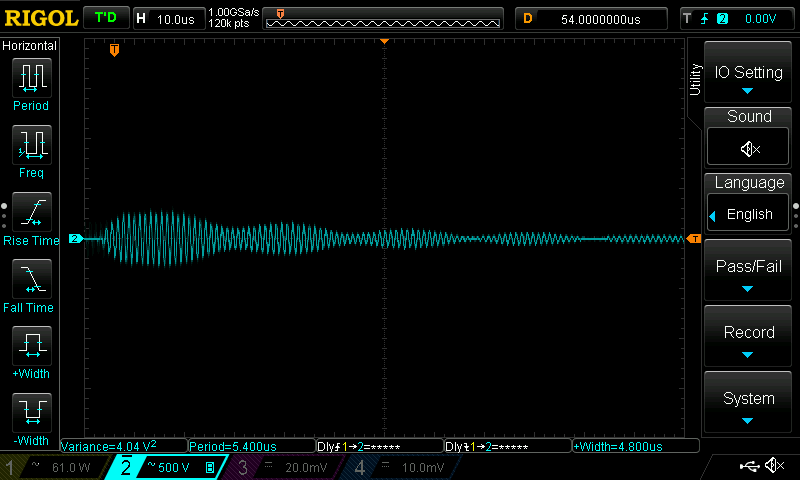 The spark gap produces additional radio-frequency interferences. 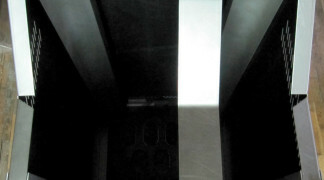 The most suitable way to shield the environment from RF interferences was to use entirely grounded metallic enclosure. In this replica, we used 2 mm thick galvanised steel plates, all of which were additionally electrically connected by thick silicone insulated cables. 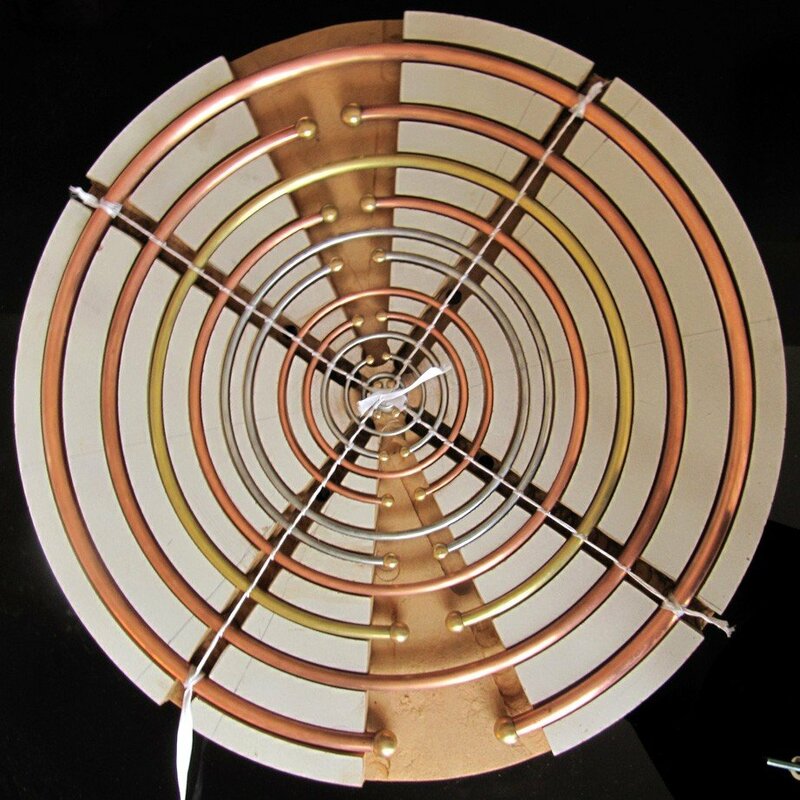 Most of the RF interferences produced by spark gap are thus removed due to the enclosure behaving as a Faraday cage. Additional hand-held implements were regularly used with the historical Multi Wave Oscillators to focus high-frequency displacement currents to particular treated areas. In fact, they are described in historical notes as an essential part of the procedures used by Dr Lakhovsky and Dr Vassileff. We manufacture replicas of the original hand-held applicators by using the original historical specifications described in the reverse-engineering report. The only detail that was modified is the use of polymer (plastic) grips instead of the original wooden ones. This modification doesn’t affect the function of the device, but it is in many respects superior, primarily in the sense of less weight, resistance to moisture and higher durability. 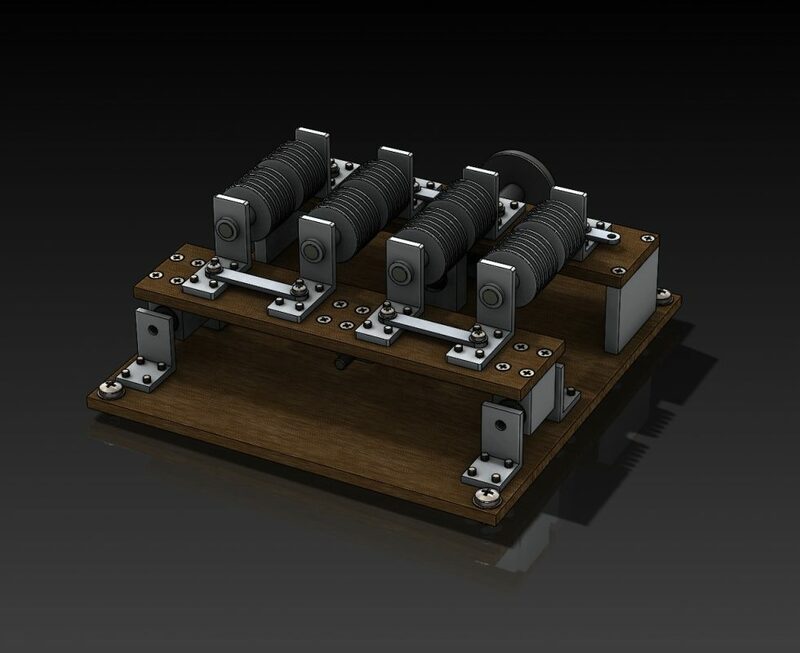 In the production of the heavy duty Multi Wave Oscillator replica, all the requirements were met and even exceeded. The device is in every significant way virtually identical to the original Multi Wave Oscillator Model BV2, operating both on 230 V / 50 Hz as well as on the 120 V / 60 Hz electrical utility systems and strictly within the historical specifications. This heavy duty device was tested under extreme conditions, and its MTBF can easily exceed 10,000 hours. The modern looking and sturdy enclosure, double insulated silicone cables for electrical mains and HV transformer output sections ensure increased levels of safety and minimised EMI/RFI interference. 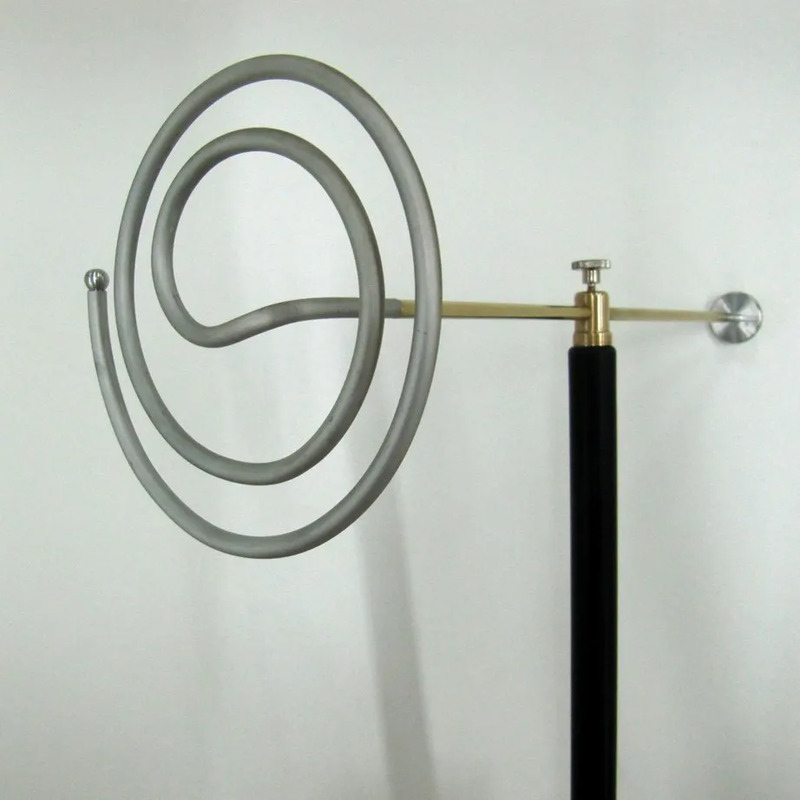 Looking to buy a Multi Wave Oscillator replica? Did you know we also have a standard version on offer? The main differences between the versions are MTBF (Mean Time Between Failure, 15.000 – 25.000 operating hours), the capability of operating for prolonged periods of time in succession (with much shorter pause) and ergonomics. To request a price quotation, please contact us by email. Hello Mr Guilbault, we have responded to your inquiry via email. Hi Alex, all the information has been sent to you by email. French text translated from internet translator possible translation error. Hello I would like to have information on the multi wave oscillator, I am from Canada, province of quebec, city of montreal. is there a guarantee of proper operation? can it be seized at the customs? if there is a charter or book or documentation that gives the uses of the frequencies, if there are options the price varies from how much to how much including the transport if possible. thank you. From the technical point of view, there is no measurable difference in the behaviour of the V-type, “Duflot” type, and our version of the spark gap, in case they are well made. Dividing a single spark gap into multiple smaller ones helps to extinguish an arc and to regulate the duration of a spark, i.e. 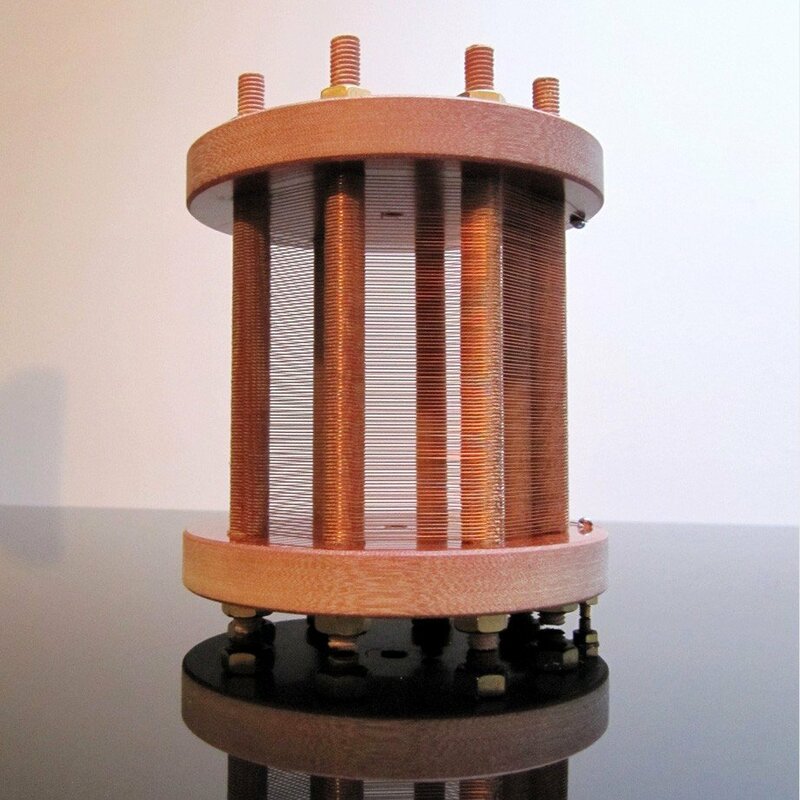 to regulate the duration of the transfer of energy from the primary tank circuit to the secondary of high voltage resonator (originally advanced by Dr Nikola Tesla). 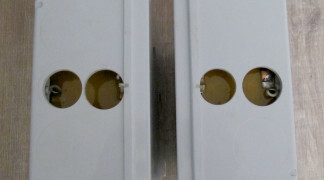 Larger surfaces of the electrodes also help to extinguish the arc and to regulate the duration of the spark. So, if the design is appropriate, there isn’t any distinction in the behaviour of different types. 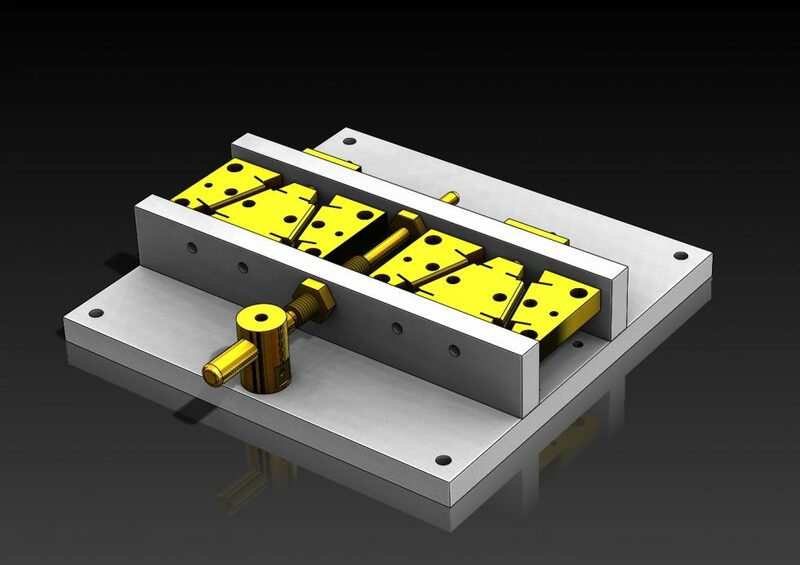 However, in practice, there are differences in the complexity of production and assembly, availability of parts, durability, ease of electrodes replacement, the precision of action and repeatability. 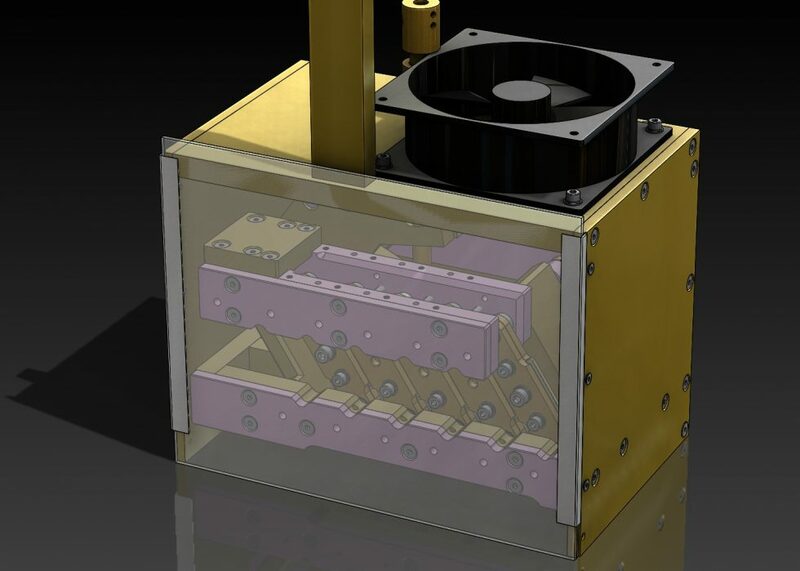 We have had an opportunity to build various types of spark gaps including V-type, “Duflot” type, and the spark gap of our design with a complex mechanism which requires precision machining of 77 individual parts (with the total count that exceeds 420). Main reasons why we chose to depart from the V-type in favour of our design are significantly increased precision, repeatability of the movement, durability of the components and the ease of electrode replacement. Guy THIEUX, friend of Serge Lakhovsky, said in a conference that the V type spark gap was made with the help of dowsers and all the secrets of this V shape are unknown but essential in a good MWO replica. Are you sure your improved spark gap has the same effect as the original? Hi Lucio, please check your email. Hi, I would like to inquire about the price of standard and heavy Duty MWO. Hi AJ, we responded to you via email. Hello! We responded to your inquiry via email. I would like to know the price of the MWO and shipping to France. Weight of the heavy-duty MWO replica body is aprox. 145 kg. We’ve just sent the pricing information to you via email. I want to know the weight and price of this product. Please let me know the shipping cost to Seoul, Korea and Kyiv, Ukraine. Hi, we’ve just responded to your inquiry. Please check your inbox. I would like to know the price of the MWO and shipping to Benin (West Africa). Hi Meggin, thank you for your inquiry. The information you requested was just sent to you by email. Hello, I’ve been aware of Lakhovsky for some years, but did not know there were units that could be purchased. As the others have asked, so do I, about the price. I too as others am in Ontario, Canada. Hi, the output voltage is up to to 6 kV. However, we can customise it as per purchaser’s requirements. Hi Alyra, please check your inbox. Hi, i would like to know the cost of this unit, and what is the voltage output of the primary transformer. Please send price and cost of shipping to Ontario Canada to my inbox. Thanks! Hello Dare. Thank you for your inquiry. We just responded via email. I would like to inquire about the cost to purchase and ship your MWO heavy duty replica of superior quality for use in Nigeria, West Africa; AC power supply is 220/240V, 50Hz. We’ve just sent you a reply via email. Please contact in us, thank you. Buenos días Odalis. We responded to your inquiry via email. Hello Kirk, thanks for your inquiry. We just replied via email. Buenas noches, vivo en Miami y deseo saber cual es el costo del oscilador y del envio hasta aqui. Howdy, please mail me some literature of cost and results. Hello Harry, while indeed some amount of frequency spectrum produced by MWO is in the microwave range, the amount of energy contained in that part of the spectra is very low as is clearly shown by measurements done by Tony Kerselaers and Bruno Sacco that were published in their comprehensive reverse engineering report http://users.skynet.be/Lakhovsky/Secrets%20Revealed.htm. How much does this unit cost with shipping? I have a concern since this ramps up into different frequency range, would it be possible to be exposed to dangerous microwaves? Hi Misty, please check your inbox. We just replied to you. Hi, What would be the cost to of a unit shipped to Ontario, Canada? Thanks! Hi Charly, we just replied to you via email. Hi Nina, please check your inbox. I would like to know the price to ship to Illinois, usa please. Thank you. I would like to purchase one and use it for therapy. I need to know the cost. I am in Canada. Also I wanted to create an elite affiliate marketing possibility with this device would that be something u would be interested in? Hello Edwin, please check your inbox. I would like to ask about the cost to purchase your MWO. I’ m interested in buying an MWO and have it sent to Greece. Please, let me know about it. I hope to hear from you soon. Hello, we just tried sending an email to you but your server bounced it. Do you have any other email that we could try? 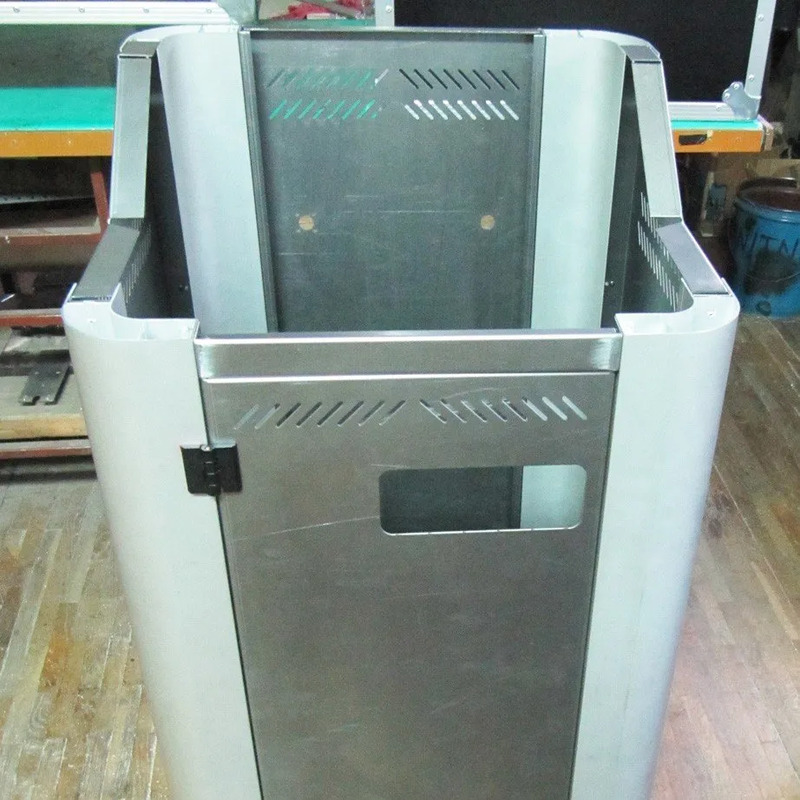 Hello,my name is Joseph LI ,I am interested in your MW0 equipment, we will be used for the Chinese market applications, we ask to do the distributor in China region, now please provide me with our samples and the necessary product manual, and Make a quote. Please reply to my mail as soon as possible! Hi, thank you for your inquiry. We will reply to you via email. Hi and thanks for reaching out. We will reply to you via email. Please tell me the cost for a unit and shipping to the United States. Could you tell me the cost of your MWO and about shipping it to the UK please? Thank you. Hello and thank you for your inquiry. We will respond to you via email. What about the cost of your MWO ? Is it possible to send it to France or to Madagascar ? What about the modalities ? Hi, thank you for your inquiry. We’ll reply shortly via email. Thank you for your inquiry. We’ll reply via email. I would like to ask about the cost to purchase your MWO and the shipping cost to Australia. Thanks for reaching out. We need to inquire about the insurance and delivery costs to Congo. Will let you know via email. Great! Would it be possible to get the price of this unit delivered in kinshasa? Thanks for reaching out. We will reply to you via email. I would like to know what is the cost of the machine and transport to France. Thank you for your inquiry. We will reply to you via email because of a variety of options available. I would like to know what is the cost of the machine and transport to Poland. Thank you for your inquiry. There are different options available. We will reply to you via email. I would. Like to know the cost including delivery to Cape Town, South Africa. Thank you for your inquiry. We will reply via email. Please provide cost of unit. Thank you for your inquiry. There are different options available. You can expect our reply via email. Thank you for your inquiry. MWO can be customised to run on any country voltage. We will reply to you in more detail via email explaining different options. I would like to enquire about the cost to purchase your MWO and if it’s compatatible for Australian voltage?